A good dental team should work like a well-oiled machine, with everyone doing their part to make your appointment run smoothly. But at our office, we also think our equipment should work like part of the team, with each new technology helping to give you the most efficient care possible. That’s why we now offer CEREC®, the state-of-the art computer that is making dental care a whole lot faster. It may seem hard to believe that a machine so small could make such an impact, but CEREC® works like a miniature dental lab to create ceramic crowns, veneers and more. First, it takes 3-D pictures of your mouth to create an exact map of your teeth and gums. Then it actually shapes the porcelain right here in our office to create a custom fit while you wait! With CEREC®, it only takes one appointment to receive natural-looking fillings, crowns and veneers — we can usually create each piece in as little as an hour, eliminating weeks of time waiting for your restorations! You get the care you need in a single visit! We have worked hard to build the best possible team to care for your teeth, and with cutting edge technology like CEREC®, we are making sure we always have new ways to make you smile. 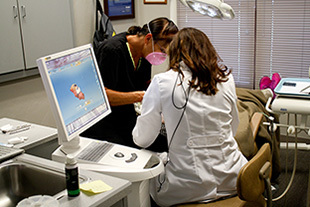 Ask us about our one-visit restorations at your next appointment.